Stocks have rallied shortly after CNNMoney's Fear & Greed Index showed signs of Extreme Fear. The market hasn't just suffered a Flash Crash like in May 2010. Heck, it's not even August 2011 -- when investors were rattled by the credit rating downgrade of the United States by Standard & Poor's. But investors are acting as if they just saw the famous shower scene in Alfred Hitchcock's "Psycho." Stocks plunged again on Wednesday. The Dow closed 238 points lower, a substantial drop. To put it in perspective, the Dow has only had five days thus far in 2014 where it fell more than that. CNNMoney's Fear & Greed Index, an exclusive indicator designed to measure market sentiment, has been in Extreme Fear mode since September 22. At first blush, it may seem a little strange that investors are this nervous. The Dow and S&P 500 are still trading near all-time highs. The Nasdaq is up nearly 6% this year. That's impressive when you consider just how well stocks did in 2013 and how long this bull market has been going on. But momentum has taken a turn for the worse lately. Stocks have been volatile in the past week and a half, ending September with a thud. One of the things that our index tracks is a key volatility index known as the VIX (VIX). The VIX usually goes up during times of financial stress. And it has risen more than 40% since the beginning of last week. Other gauges in the Fear & Greed Index are showing troubling signs too. According to our "safe haven" demand indicator, investors are fleeing stocks for bonds. More stocks have been hitting 52-week lows than 52-week highs. The volume traded in stocks going down on a daily basis is higher than the volume for stocks going up. It makes sense. There are a lot more things to be scared about now than just a few weeks ago: Ebola. ISIS. Europe's economy. Protests in Hong Kong. Smaller stocks hitting a technical level known ominously as the "death cross." And those who believe stocks are in a bubble that's about to pop have several examples of froth to help them make their argument. Alibaba's (BABA) blockbuster initial public offering on September 19 could be categorized as a seminal market top moment. 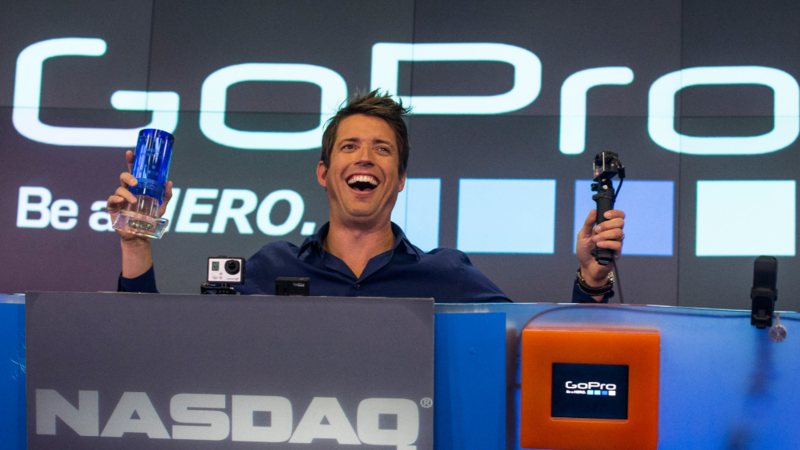 Ditto for the continued surge in shares of wearable digital camera company GoPro (GPRO) since it went public in late June. The stock has nearly quadrupled from its IPO price! But there a ton of cliches that market bulls can trot out at times like this to remind investors it may be a good time to take advantage of the turmoil and do some bargain hunting. Buy the dip. Buy when there's blood in the streets. The darkest hour is just before the dawn. All of this many sound trite, but there is truth in it. 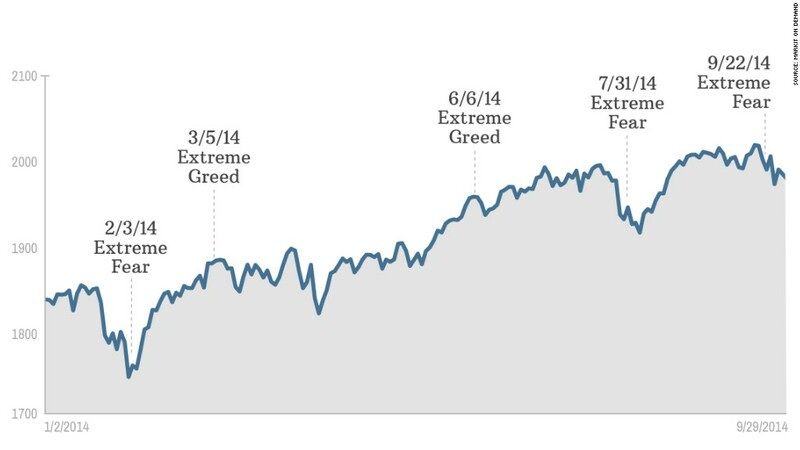 Stocks have often rebounded after our Fear & Greed Index has hit an Extreme Fear patch. By the same token, an extended stretch in Extreme Greed territory could be an omen of some bad things to come in the short-term. Make no mistake. Our index is not predicting what stocks are going to do over the long haul. In bull and bear markets, there are always going to be times when Wall Street's emotional pendulum shifts between sadness and euphoria. But investors are scared right now. And with good reason. Whether or not they are still this fearful in a few weeks or months remains to be seen.